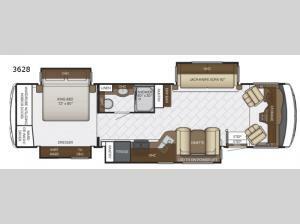 After a day of exploring and playing outdoors come relax in the comfort of your home-away-from home with this Bay Star 3628 quad slide out class A motor home. There is comfortable seating throughout from the 92" jack knife sofa to the dinette, and the swivel driver and passenger seats. In the fully functional kitchen you can prepare your favorite meals, and after dinner come watch TV in the living room or in the bedroom on the king bed.